Welcome to the enticing world of Burlesque! Join us for a fun-packed evening of great electro-swing tunes, hilarious comedy, amazing close-up magic and of course, wonderful Burlesque! 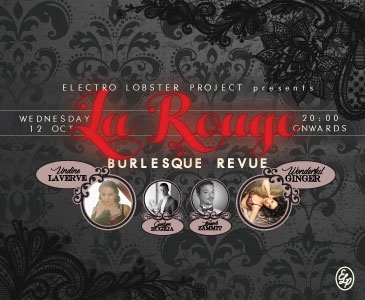 We'll paint the club red for the night, La ROUGE will entertain you as you sip exclusive cocktails, themed to fit our 20s/40s-50s theme. Feel free to dress up and go back in time into the carefree and fun-loving era of golden age glamour and chic! On the night - Undine LaVerve (Malta) and Wonderful Ginger (Rome, Italy) will ignite the stage with fierce and exciting classical Burlesque acts, while Joseph Zammit will thrill you with song and jokes and Gwilym Bugeja will amaze you with his incredible magic! Doors open at 7 pm, show time at 9 pm! Electro Lobster Project, in collaboration with Undine LaVerve, is proud to present the first of these one of a kind events!